With a little over a year to go before the start of the 2019 federal election, we polled 2,000 Canadian adults last week about how they are seeing their political choices. Today, 43% say they would prefer to see the Liberals re-elected next year, and 57% would prefer a change in government. Last July 50% said they would prefer the Liberals to be re-elected. This shift means the landscape is more competitive today, but worth bearing in mind that the Liberals were elected with just under 40% of the vote in 2015. 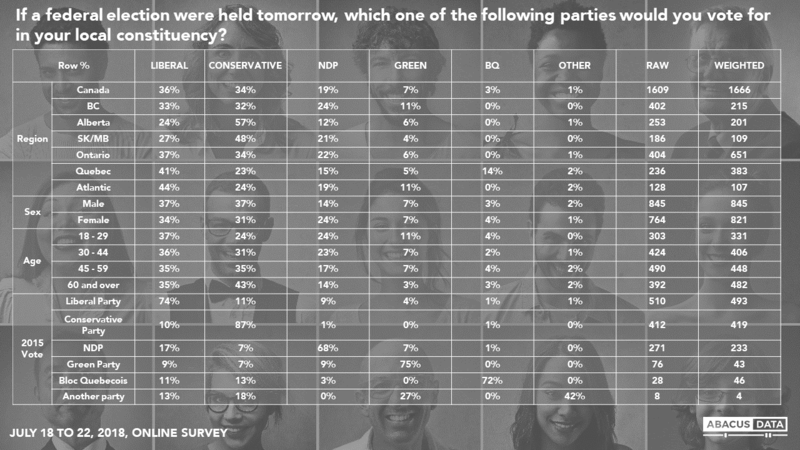 Today 52% say they would consider voting Liberal, 51% would consider voting Conservative up and 49% are open to considering the NDP, an unusually close pattern among the three parties. If a vote was held tomorrow, 36% would vote Liberal, 34% Conservative, and 19% NDP. We see competitive races in Ontario and BC (Liberals and Conservatives), while the Liberals lead in Atlantic Canada and Quebec and the Conservatives have a lead on the Prairies. Today, 42% say the country is heading in the right direction, 44% approve of the job being done by the federal government 43% have a positive impression of Prime Minister Trudeau. When asked if the government could do anything to change their mind, 14% (or 8% of the population overall) said “yes, for sure” while another 33% (19% of the population overall) said “there could be”. In other words, the number of “hard change” voters is about 30% in total. 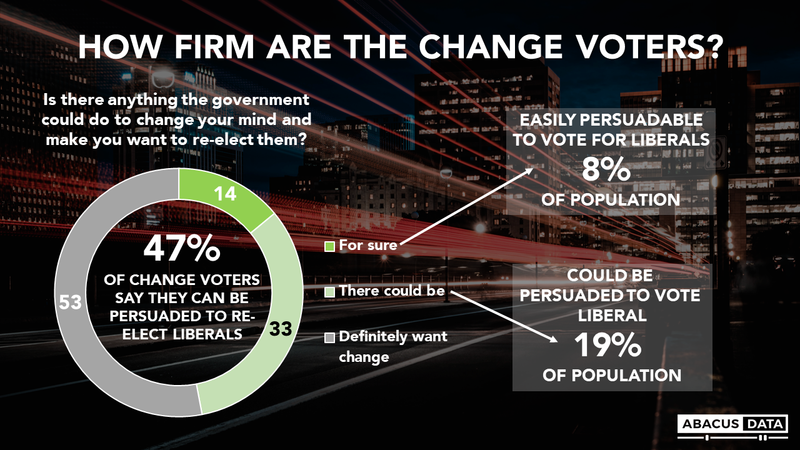 Among voters who say they are inclined to vote for a change but could be persuaded to vote to re-elect, 30% voted Liberal in 2015, only 15% would today. 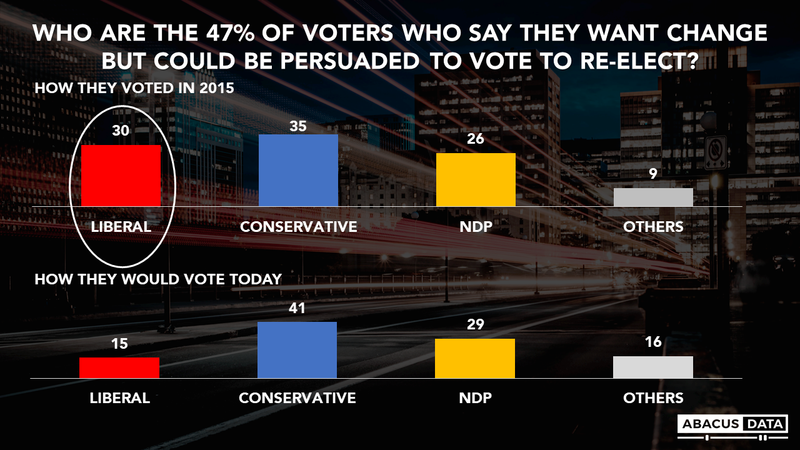 35% voted CPC – 41% would today. 26% voted NDP – 29% would today. We asked people to tell us which of several potential factors had been contributing to their desire to change the government next year. Overall, fiscal and tax issues rank high in importance as do immigration and refugees issues and the PM’s trip to India. However, what is more instructive is to look at separately at the change voters who are leaning toward the NDP and Conservatives. Among current NDP voters who say they could be persuaded to re-elect the Liberals, the Trans Mountain pipeline is at the top of the list of grievances with the government along with electoral reform and fiscal management. 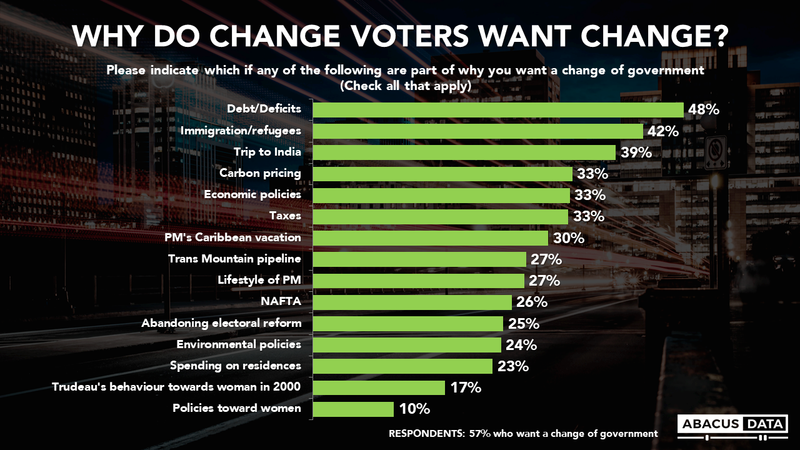 Among those who say they will vote Conservative but could be persuaded to vote to re-elect, debt/deficits, immigration and refugees and the PM’s trip to India rank one-two-three followed by carbon pricing, taxes, and economic policies. 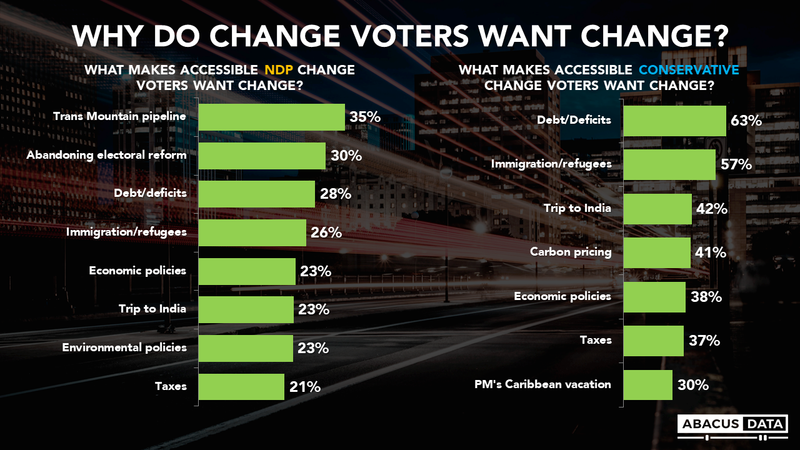 Conservatives are much more likely to be concerned with the PMs vacation in the Caribbean compared to New Democrats. Bruce Anderson: “For the most part, polling during a government’s mandate reflects how people are reacting to the government – and not so much about its competitors. As Canadamoves closer to the 2019 election, people will start to evaluate not only the incumbents but the alternatives. David Coletto: “The Liberals are still well positioned about a year before the next election begins. 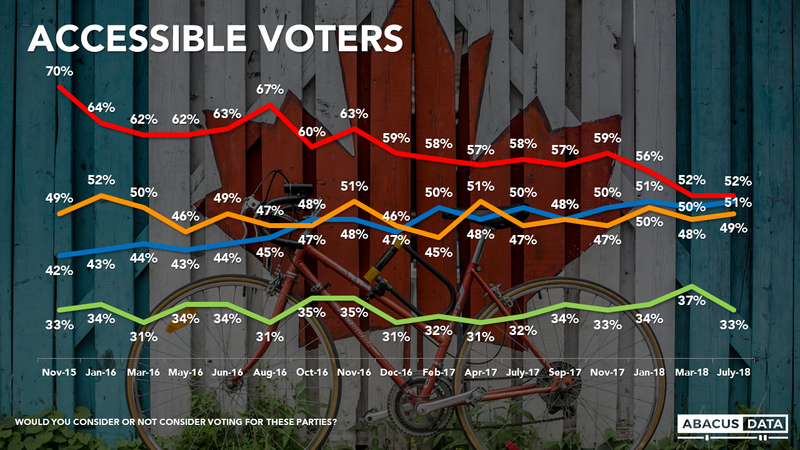 But some storm clouds are approaching including Conservative gains in Quebec, weaker support among older voters, and rising concerns about immigration and refugees, especially among Conservative-leaning voters who are open to voting Liberal. The pools of accessible voters for all three parties are closer in size than they have been since the last election and increasing volatility in Ontario and Quebec means predicting what will happen over the next 12 months is increasingly difficult. Our survey was conducted online with 2,000 Canadians aged 18 and over from July 18 to 22, 2018. A random sample of panelists was invited to complete the survey from randomly selected Canadian adults who are members of the Maru Voice Canada online panel. The Marketing Research and Intelligence Association policy limits statements about margins of sampling error for most online surveys. The margin of error for a comparable probability-based random sample of the same size is +/- 2.2%, 19 times out of 20. The data were weighted according to census data to ensure that the sample matched Canada’s population according to age, gender, educational attainment, and region. Totals may not add up to 100 due to rounding.